You won't find a better pizza deal in Northeast Ohio. People in Northeast Ohio don't get too fancy when it comes to pizza. They like basic traditional pies. And most of all, they want a great price. Georgio's Pizza offers the best pizza deals in Northeast Ohio. I've had a lot of pizza in my life. A lot. When I lived in Las Vegas, I started a blog called "Las Vegas Pizza Quest" - I think it's still around. I'll have to check. After eating pizza every Sunday for a couple months, I came up with a formula to gauge if the price of the pizza was right. It was simple - $1 an inch. A 14" cheese pizza shouldn't be higher than $14.00, unless it was made with a blend of goat, armadillo and squirrel cheese. If the price per inch was less than $1.00, that was a pretty good deal. Remember, I'm talking about a cheese pizza as a gauge. One of my favorite pizzas in Las Vegas was Rosario's Pizza. They came from Chicago and featured deep-dish pizza. A large pizza (12" with 8 slices) with two meats was around $22.00. However, even if you were starved, you could barely get through two pieces. Other great pizza joints in Las Vegas were Metro Pizza, East Side Pizza (which is actually on the west side near Boca Park), California Pizza Kitchen and Sammy's Woodfired Pizza. All of these eateries provided a great product. However, as your stomach filled, your wallet emptied. All of these places flirted with or exceeded the $1.00 an inch bar for a cheese pizza. But it was a 3-cheese blend. LOL. Start adding toppings and you better order a water with your meal and hope you don't need to sell gas in the parking lot to cover the bill. When I returned to Ohio (against my will), I had to ratchet down the $1.00 standard. Most of the major chains were selling 12" pizzas for $10 on varying special offers that came and went. That put the local gauge at 83¢ an inch. Then, I found the perfect pizza for broke people and traditional pizza lovers that had a lot of mouths to feed. How about this... 35¢ an inch. That's right, 35¢ an inch. And this wasn't a special, this was the every day price. Where was it? Georgio's Oven Fresh Pizza Co.
Any day of the week, you can get a 14", 10-slice, made fresh cheese pizza in 7 minutes at most Georgio's locations for only $4.99. And now, they're even including a pepperoni pizza for the same price - limited time only, I think. The 14" 10-slice pepperoni and sausage pizza for $5.99. I usually get the pepperoni and sausage pizza for $5.99. I can buy 2-liter bottles of Diet Coke at a local discount store for $1.00 a bottle. So, I know how to eat cheap. For a guy with little available cash, this is a godsend. Georgio's offers a full range of tasty treats - calzones, sub sandwiches, salads, bread sticks, boneless wings, specialty pizzas - all at a ridiculously low price. If you're on a budget, don't knock over the dominoes, Caesar is just too little and forget the hut - call Georgio's. Besides the price, I love the fact that they are almost as fast as fast food. Their pizzas are cooked in a very high temperature oven on a conveyor belt. Pizzas are ready in 7 minutes. Yes, seven. I can call and order a pizza for pickup, hop in my truck and by the time I get down the street to Georgio's Pizza, it's just coming out of the oven. Now, I have had better pizza's, but I've also paid a much higher price for them, too. If you have kids and you live or recently lived in Las Vegas, you may remember Peter Piper Pizza. The dough of Georgio's Pizza is very similar to the soft crust at the Piper - tender around the edges, golden brown on the bottom. The trick was, a Peter Piper pizza with a couple toppings was $15.00. And the sauce had no seasoning, only tons of salt. The day after eating a Peter Piper Pizza your lips shriveled up like raisins. You couldn't drink enough water to quench your thirst, even if you stood in the shower with your mouth open for an hour or two. Georgio's Oven Fresh Pizza has plenty of flavor. For what you pay, it could be cardboard and you couldn't complain, but the pizza's are good enough to eat regularly. Georgio's Pizza has a simple story. I copied this from their website under History. As a University student working at a local pizza shop in Detroit, Michigan, George Chamoun realized that there was something missing from national pizza chains: a superior-quality traditional pizza. His dream was to one day open a pizza restaurant that would fill that void. 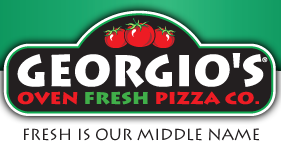 Founded in 1999, Georgio’s Oven Fresh Pizza Co.® specializes in the production of fresh, high quality pizzas, calzones, sub sandwiches, wraps, salads, wings and more, all at a great value. Open for carry-out and delivery during lunch and dinner hours, the customers loved the pizza so much that George was able to place 43 locations across Northeast Ohio and is planning to expand its presence in the area and beyond in the near future. Most importantly, George remains committed to his heritage of making a superior-quality, traditional pizza. A list of all of their locations can be found on their website, along with current specials. Some of the franchise stores offer different specials than the corporate stores, but you can always call and find out what they are offering. I did notice on their location finder that they just opened a location in Boynton Beach Florida. I smell tax deduction, laced with oregano. Hey, George has worked hard for 12 years, he deserves a nice write-off to fly down and check out his new store during the frigid Cleveland winters. So, if you check your ole wallet and see that there isn't a lot of cash and you're starved or the kids need to be fed, keep in mind Georgio's Pizza offers the best pizza deals in Northeast Ohio.